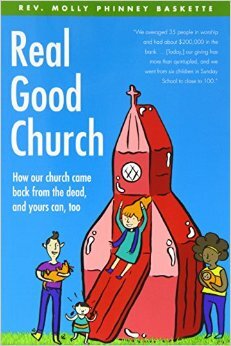 Real Good Church: How Our Church Came Back from the Dead, and Yours Can Too by Molly Phinney Baskette, Pilgrim Press, 2014, 228 pp. Let me start by saying that I knew going in to this book that Molly Phinney Baskette and First Church Somerville are the real deal. I got to know Molly when I served in Boston, and I was privileged to watch some of this transformation with my own eyes. I was there in the early years, when it was still fragile and uncertain, which makes it all the more exciting and encouraging to read about a church that is now thriving as a model for others. This book tells the story of how they did it. I read a lot of books of advice for leading and transforming churches. Some of them sound like impossible plans only a consultant could concoct. Others promise that “if you just do this one thing, your church will turn around.” Still others offer a lot of theory, but not a lot of practical advice. Real Good Church manages to avoid all of those pitfalls. It’s packed with practical wisdom acquired from hard-earned experience, but it also offers a deeper reflection on the Spirit of God at work. The tone throughout is light-hearted and conversational, so you feel like you are carrying on a conversation with a friend in ministry. It’s a great resource. One of my favorite insights comes early on–the need for clergy to be “Doomsday Pollyannas.” We must be honest about the realistic potential of demise, but also offer hope. I love this term and description, and I have found it true in the life of my own church. We are able to move forward best when we share both a sense of impending doom and impossible (or only possible with God) hope. She returns to this idea later, as well. Another important insight running throughout the book is the connection between the church and its community. First Church Somerville did that with a Drag Gospel Sunday, participation in local parades and festivals, joining in the Red Sox excitement with outdoor viewing, office hours in the local coffee shop, and more. Baskette is clear that this is not a program for you to follow in your church, because they are rooted in the local community in Somerville and the identity of their congregation. However, every congregation can find the life and energy in their community and become involved. We can all shift our ministries to focus on “them” (those people who are not already active in the congregation) rather than “us” (church members’ tastes and needs). The book has sections on everything from job descriptions to e-mail to worship to conflict to facilities management. The appendix is rich with examples of materials used at First Church Somerville. It radiates with the author’s creativity and energy for ministry. I recommend it first for pastors, especially those serving churches in need of revitalization. It would work as well for lay leadership in those churches, but the sheer wealth of material might be overwhelming to a church council without a careful plan to absorb (and implement!) ideas slowly. You’ll learn a lot, enjoy reading it, and leave encouraged for the possibilities for the future of your church.